In the media, robots are sensationalized as the future of senior care. Research and development in this area receive a lot of funding and public interest. During the nearly two years I spent researching in Japan, a nation celebrated for being at the cutting edge of high-tech senior care, I saw a number of technical innovations in the research labs of aging studies specialists as they worked to design devices that would improve or maintain the physical and mental functioning of seniors. But as yet the actual use of these innovations inside the home, care facility, and hospital have remained relatively minimal. The commercial cost of advanced technologies for rehabilitative, preventive, and assistive purposes is one factor inhibiting its successes. Another – they are too complicated and too demanding for care workers and seniors to operate and maintain. There is a palpable divide between the ready incorporation of technologies that require a high degree of user-engagement and those that require relatively little. Enter into almost any senior hospital or nursing home in Japan and you will find an assortment of passive technologies ranging from sensors in the beds, on the floors, and at the doors poised to notify personnel when and if a client or patient is on the move. Visit a day care center in Japan and you will find a single function device that comes ready-loaded with music and videos for senior exercise and entertainment (this means Karaoke). You will also find washrooms outfitted with automated bathtubs that require you only to load the client into the wheelchair bay and it moves them into a resting position to begin jet propulsion washing. 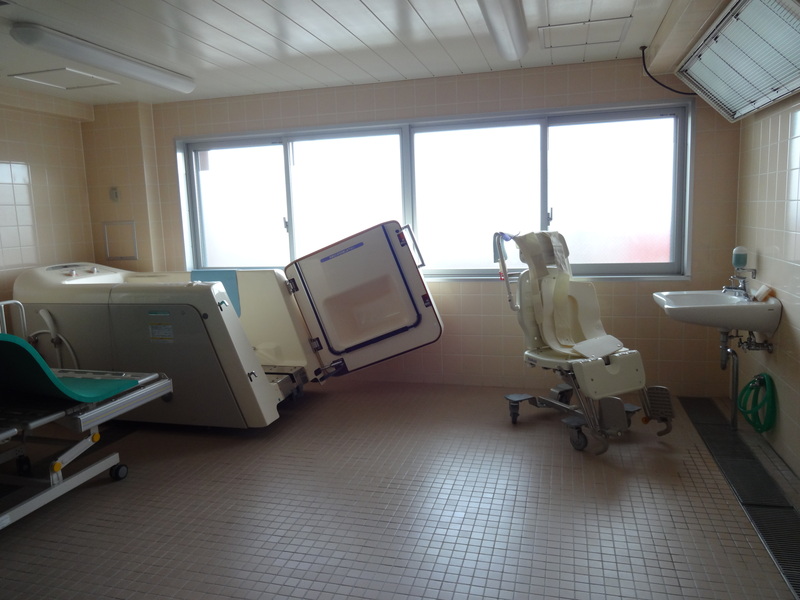 In Japan’s rehabilitation centers there are a variety of exercise machines available that are particularly designed for subtle weight increases and safe movements sensitive to the prone body of older adults. All of these innovations are assistive, rehabilitative, and preventive technologies, but they are also all passive technologies that require straightforward user engagement (turn on and it assumes its rather singular function). Day care center’s automated bath for wheelchair bound seniors. But what of these purported cutting edge technologies we hear so much about: Paro the robot seal, the future companion for socially isolated seniors; Or supplementary caregiver robots like Robear that can lift bedridden seniors? Some have passed beyond research and development and are commercially available, but few will be found in your typical home, day care, hospital, or nursing home. I have only ever seen a robot seal in the closet of a day care facility where it was banished after it broke down too many times and it was clear that the senior clientele was avoiding it anyways. Robear lifting someone from the bed as the care worker looks on (source: http://bit.ly/1A1Ippz). Continuing to pursue and perfect robots and other advanced technological devices for use in prevention, rehabilitation, and care is of course important. The media has already announced that the future of care is digitized and robotized, the next step is to get it out of the research lab and further streamline these complex technological functions to make them user friendly and intuitive for both care givers and possibly mentally and physically disabled clients. But as I have tried to call attention to here, there is a whole cadre of technologies used in care, rehabilitation, and prevention that have passed under the media radar – automated baths, bed and floor sensors, and GPS tracking. While less sensational than a robot parading around the home or hospital, these innovations have been equally if not more successful in alleviating the burdens of care and enhancing the lives of older adults because they have already been successfully integrated into senior care. I have been referring to these technologies as passive, perhaps a better term would be semi-independent insofar as little additional care is required to maintain or utilize them. “Low-tech” devices (a name which I disapprove of, but will use for clarity’s sake), such as canes, walkers, hearing aids, and handrails, can also be considered individualized and semi-independent technologies; no engineer is required to oversee and regulate its use and maintenance work is minimal. It seems to me that if technology is to be the future of care, then forming specialized devices that can seamlessly integrate into already existing care environments without requiring excessive user-engagement for continued programming and maintenance is of the utmost importance. This means R&D projects related to smart homes and other smart technologies (celebrated for their independent functioning and seamless integration into daily life), will be seen inside homes, day care centers, and nursing homes well before robot caregivers…unless you are looking in the closets. I always wonder if Japan is the only country to invest so much in robotic technology for eldercare? To the point where even exoskeletons, responsive beds and other pseudo-cyborg tech is thought of as robotic, rather than “just a machine” as it might be classified elsewhere. Tech, whether it is a call button, a cane, or a robear is always only a partial solution, and depends on people (carers, publics), infrastructures (bureaucracy, insurance), and physical environments to make it work. Should we be talkig more about the ‘biosociotechnical ecosystem’ or something of that sort? Interested to know what others think!